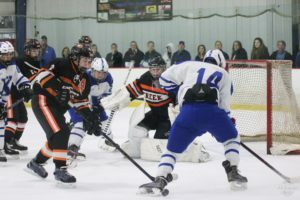 Beavercreek and St. Xavier faced off against each other Sunday afternoon for what was not only the final game of regular season play for both teams, but also a battle against two teams that were 12-0 in SWOHSHL play. The Beavers were the number one team in the SWOHSHL Gold Division while the Bombers were the number one team in the SWOHSHL Red Division. Although the post season tournament seedings were already set for the two clubs, this game would decide who would have an unblemished SWOHSHL record at seasons end and was perhaps also a precursor to another meeting in the SWOHSHL Red Division Tournament next weekend. The game had a fast pace to it, with both teams making rushes up and down the ice. However, the defense for both teams was also relentless and it was hard for either team to get many quality shots. Both goal tenders were at the top of their games, but Creek’s net minder Kevin Bovair made a number of great saves to keep the game scoreless. In the final minute of the first period, however, the Bombers finally got one past him after a scramble in front of the net and had a 1-0 lead at the first intermission. Although Creek was trailing, their confidence seemed to grow as game went on. The Beavers started to dictate the play more in the second and had a number of scoring chances, but were not able to get on the scoreboard. 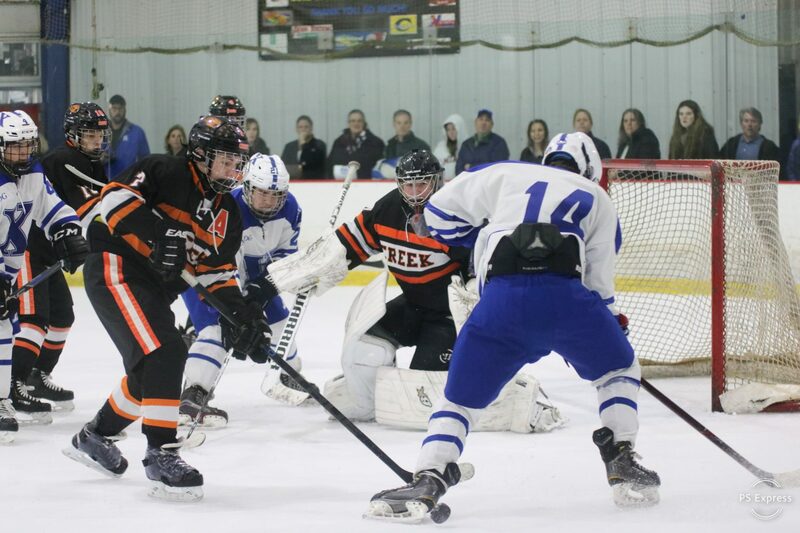 Creek continued to build on their hard nosed play in the third period and were finally rewarded midway through when Thomas Bush deflected a wide shot by Braden Cox past the Bombers net minder, knotting the game at 1. The game remained 1-1 late into the game and appeared to be going to OT, but with only a few minutes remaining the Bombers took back the lead on a nice cross ice pass and shot that just beat Bovair. The Beavers kept fighting until the end and even pulled their net minder for an extra attacker, but were not able to get the equalizer. Bovair was stellar again between the pipes for the Beavers and turned away 34 Bomber shots on the afternoon. Although Creek lost the game, their fans were very happy with their effort and agreed that it was a great game to witness. The team is firing on all cylinders and will be raring to go for the SWOHSHL Red Division Tournament this upcoming weekend. The Beavers first round match up will be against the Centerville Elks on Friday at 6:30 PM at South Metro Sports. The game will be lived streamed by Lee Mowen on Centerville’s YouTube channel. That being said, all Creek Hockey fans know that there is nothing better than watching the boys play live so come on out if you can and cheer your Battlin’ Beavers on to victory!! ← Creek Blanks Elder 12-0 on Student Appreciation Night!